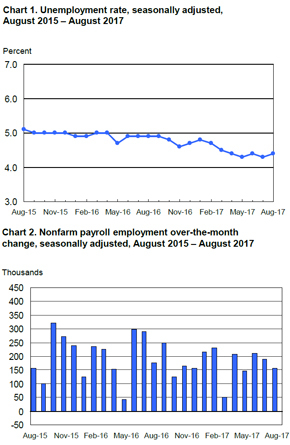 The August Employment Situation Summary released by the Bureau of Labor Statistics revealed a slowdown from 209,000 jobs added during July, to 156,000 nonfarm payroll positions created. According to The Washington Post, August’s number notably undercut federal economists’ expectation that about 200,000 jobs would be added to employers’ payrolls. However, some private-sector analysts, like Indeed.com Chief Economist Jed Kolko, noted that this reduction in growth may be somewhat deceptive. Additionally, although the unemployment rate rose to 4.4 percent from July’s figure of 4.3 percent, the latter is a 16-year low, and because the Post reported that the uptick is considered small enough to remain within a reasonable margin of error, it is unlikely to worry public- and private-sector economists. CNBC noted that within a year, unemployment in the U.S. could easily fall below 4 percent. On a sector-by-sector basis, manufacturing, construction, and professional and technical services saw the largest gains in August, with 36,000, 28,000 and 22,000 jobs added, respectively. The jumps in manufacturing and construction employment are particularly notable: Manufacturing grew by 155,000 roles since an all-time low employment total in November 2016. Meanwhile, construction remained relatively unchanged for the last five months, but received a notable boost from residential specialty contractors, whose businesses accounted for 12,000 of all positions added within the industry. Healthcare employment did not grow by as much as it did in July – with more than 20,000 jobs added in August as opposed to July’s 30,000-plus positions created. Nevertheless, it remains one of the most fastest-growing industries in the U.S., with 328,000 jobs created thus far in all of 2017. Other industries including food services and drinking places, wholesale, trade, retail trade, transportation and warehousing, information, financial activities and government changed very little over the month. Some metrics noted in the BLS’s August report bear with them more uncertainty than the individual industry gains and essentially unchanged unemployment rate noted above. Average wages grew by 3 cents in the past month, a drop from the 9 cents seen in July. Also, the labor force participation rate for August 2017 held steady with July’s 62.9 percent, a total that analysts generally view as sub-par if not necessarily dangerous. The New York Times noted that economists also believe the Federal Reserve is likely to raise interest rates on federal loans before the year ends, likely in December. Though the Fed will meet in September, a rate hike isn’t expected then. Wall Street traders, meanwhile, have reduced their own expectations of a rate increase from 50 percent to 30 percent. However, this does not necessarily indicate a negative perspective, as Torsten Slok, chief international economist at Deutsche Bank, pointed out. “There’s no sign of inflation, which keeps the Federal Reserve on hold in terms of interest rate hikes,” Slok said to the Times, “and it suggests stocks should keep doing well.